Welcome! If you’re new here, every month I write a detailed report about my online earnings. I talk about exactly how much I’ve earned, where it comes from and most importantly, the lessons I’ve been learning in and around my businesses. I’ve been reporting my income since October of 2008, and each and every report brings different lessons to the table. As I keep learning, tweaking, experimenting and crash-test-dummying, I will keep reporting and sharing information to help you as much as I can. Let’s dive right into this month’s report. It’s always good to keep track of stats and analytics. Stats give you insight into your business that you cannot see on the surface and you can make decisions moving forward from there. For example, the things that work you keep doing, and the things that don’t work, you stop. As simple as that sounds, sometimes the numbers just don’t make any sense. On May 15th, something interesting happened to my podcast download stats. They increased by nearly 50%, and have not dropped off since then. The spikes you see in the graph above are the days that a new episode of the SPI Podcast goes live. 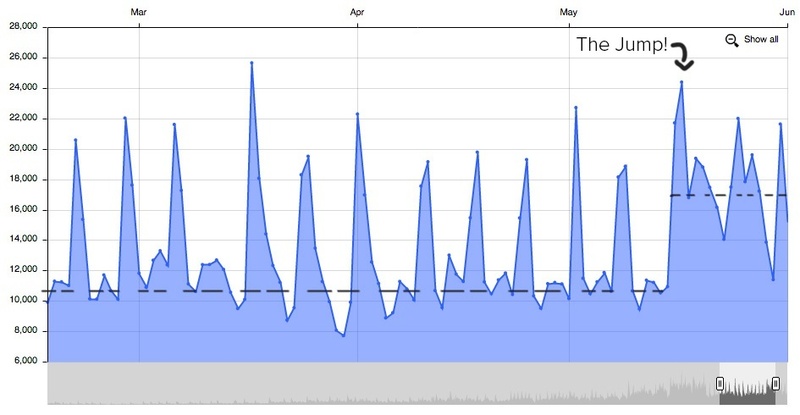 The spikes occur because when an episode is published, 31,000+ subscribers get it on their devices on that day. Not all subscribers listen right away, but many of them do, as you can see. Between episodes, prior to May 15th, you can see that the average daily download was hovering around the 10k to 12k mark. And then, all of a sudden, mid-May comes around and the average nearly doubles! When new episodes are published, however, the spikes peak at virtually the same level. Traffic to my blog had actually gone down during this time, so there’s no correlation there. Ever since this happened, I’ve been looking for answers. I want to know why this happened, so I can do more of this and perhaps optimize these opportunities and new traffic sources, whatever they may be. While asking around, the only conclusion I came up with is that several other podcasters saw the exact same spike on the exact same day, which is really interesting. I’m not complaining, of course! It’s more downloads and eyes (and ears) on my brand, but I really wish there was better data and analytics out there for podcasters. It’s hard to know exactly what’s going on with our listeners, and with the growth of podcasting during the last year you’d think we’d have better ways to figure all of this out. If you have any ideas, or if you experienced the same jump as I did, please leave a comment below because I’d love to hear your thoughts! It could simply be an algorithm change within iTunes for older episodes. Although the outcome of this mystery is positive for me and my fellow podcasters, what if the numbers went in the opposite direction? Of course, we’d all be furious and be asking for answers, and who knows if we would get them or not. The valuable lesson here is that you have to be smart about your business if it relies heavily on something like iTunes, Google or some other third-party that you have no control over. I’ve seen people have their entire monthly income get ripped away in an instant as a result of having relied too heavily on one specific company. People’s Google Adsense accounts getting banned for no reason, revenue-sharing article directories getting shut down or bought out, Facebook or some other social media platform changing the rules – it happens. So how can you soften the blow if it were to happen? The quick answer: diversify and feed people into your email list. Oh, and be sure to export that list from your email service provider every once in a while to actually have that list on your hard drive somewhere, in case that provider were to shut down too. It’s been two months since experimenting with monetization efforts on my new niche site at FoodTruckr.com. See the Niche Site Duel HUB for information about how this niche was selected and how the site was launched. We’re over $200 total after only using Google Adsense, which is always a good first step. The steady clicks (even though the volume isn’t mind-blowing) are a good sign. It validates the commerciality of this niche a bit (i.e. if there were zero clicks I’d be scared), and I feel more comfortable moving forward as I begin to introduce products and other higher-level monetization opportunities. Speaking of which, an eBook is being created for the site and will be launched in the next month or two! Marketing efforts to collect interest (and an email list of potential buyers) will begin in early July. This book will be a compilation of a series of posts that have been published on FoodTruckr.com over the past few months all about how to start a food truck – every little step of the way. Now, you might be wondering – why would anyone want to pay for a book that has a lot of the same information that could be found directly on the website for free? Great question, and one that scared me to death when I launched my first eBook at GreenExamAcademy.com nearly 6 years ago. That book (which was actually a study guide) was 95% the same exact material that could be found directly on the website for free – word for word. I kept doubting that it would sell. Or, if it did sell I imagined hordes of angry emails from customers demanding a refund. After chatting with people in my mastermind group, I learned that people happily pay for convenience. An eBook is much easier to read than separate pages on a website, it’s something that can be taken with you where ever you want (especially if you can print it or read it on a mobile device), and you’re more likely to have people take action if there’s a specific purpose behind it. Since taking the plunge and selling that eBook in October of 2008, I’ve sold tens of thousands of copies and out of all of the books I’ve sold…only one person has EVER complained about the fact that the same material was on the website for free. I gave that person an immediate refund, of course. Additionally, if you’ve provided value for an extended period of time to an audience, they’re likely to buy your material primarily because they like you and appreciate what you’ve already done for them. I found this to be the case as well when I launched that eBook. Dozens of people who had already passed the exam bought my study guide anyway to thank me for all of the free information and help I gave them. You may also be familiar with a blogging workbook called 31 Days to Build a Better Blog, by Darren Rowse. This book is simply a compilation of a series of blog posts that were previously published on ProBlogger.net. He had freely published 31 posts in 31 days (about building a better blog), and it was so wildly successful that he decided to turn it into a book, and the book sold extremely well too, and continues to do so. Again, people will pay for convenience. Think about Amazon. Sometimes it’s cheaper to go to the store and pick up a product, but we buy it on Amazon anyway because it gets delivered right to our doorstep. That’s why the Amazon FBA (fulfilled-by-Amazon) program works so well. You can buy items for a discounted price in clearance areas at local stores and then sell them for much more via Amazon because people who don’t have easy access to those things want it conveniently shipped right to them. This is what Jessica and Cliff Larrew do, our featured guests on SPI Podcast Session #99 who make 6-figures a year with Amazon FBA! Anyway, getting back to the point…I’m very excited to launch this eBook. It’ll be sold directly on FoodTruckr.com using GumRoad for the cart and payment solution, the same one we used for The Smart Podcast Player beta launch. The launch happened in June though, so look out for more info about how that went in June’s income report. There will likely be 3 tiers of products one can purchase, each with varying levels of bonuses and add-ons to the book that are beneficial for the beginner food truck owner. In addition to providing a ton of value, the goal of the book is to make money more so than getting more eyes on the brand and generating traffic with it. If traffic was the main motivation, then I’d rather launch it on Amazon.com instead. I look forward to sharing details about the lead-up to the launch, as well as the outcome. Am I confident it will sell? I’m sure it will sell, but how well – I’m not completely sure. There will be a lot of experimentation in terms of where traffic is coming from and where sales are made. Does direct traffic from the site sell more, or do the Facebook advertisements or banner ads for the book on other sites convert higher? We shall see. No matter what though, it’s going to be fun! I’m currently in a growth phase in my business that is beyond what I can handle on my own. It’s kind of cool because I’m getting more and more traffic and exposure online, however it comes with having more to do, more people fighting for my attention, and bigger plans and projects that are beyond my personal capability. I never envisioned what this would be like, mostly because I never thought I’d get here so fast, but now that I’m here I’m trying really hard to make smart decisions to grow the business the right way, hire the right help but not get out of control and grow into something I don’t want. And most importantly: I want to make sure the integrity of the brand that created this momentum in the first place stays the same. Luckily, those who are helping me have the same business (and life) philosophy as I do : be honest, be authentic and serve others – the rewards will come from that. Oh, and have fun, of course! Managing the team has been another experience that’s new to me online, although I do have experience in college managing a higher-up committee in the marching band and there are a lot of similarities in terms of dealing with the team members, keeping them happy, having them contribute and feel proud and motivated – things like that. I recently published SPI Podcast Session #114 which features an interview with a few of my team members. Specifically, it’s an episode about how we created the new SPI iOS application in less than 8-weeks (you can download the app for free here!) using agile production methods. It’s a little technical for some, but you can see the kind of people who are on the team and how awe all work together. The next podcast going live this week (#115) is with Jessica, my newly hired executive assistant who has, in a month, helped me go from inbox 9000+ (and that’s UNREAD emails) to inbox zero consistently throughout the week. She’s awesome and has a lot to share about how she tackled my inbox so you can hopefully get yours under control too. Look out for that episode soon. You can download the app or subscribe to the show and get that episode immediately delivered to you when it’s live. What I love about working with a team is how we’re all working together to create systems within the business to make things better, cleaner and more streamlined so things get done efficiently. I love that. For example, with my new podcast, AskPat, all I have to do now is record the answers to the voicemail questions that come in, and Mindy has a way to take those files from dropbox and QUICKLY get a new episode up and published on Soundcloud. Less work on both our ends, but it took a lot of communication up front to make it work so well. There was a lot of “I think we should do this”, or “You should label your files like this so that…”, etc. It’s awesome, but with anything like this there’s definitely a commitment of time (and money) upfront. In June, a lot of what my team and I have been working on have finally come to light, like the iOS app, and the Smart Podcast Player, which I’m excited to talk about next month. I’m always learning, and am glad to share the ride with you! In 2011, I hired two amazing VAs from the Philippines, Mike (a developer) and Nica (an admin), who I found thanks to Chris Ducker and his service, Virtual Staff Finder. I worked with them for over 2 years on niche site projects and other things and they always did what I had assigned them to do very well, and in a very timely manner. Unfortunately, the projects I had them working on finished up and so I didn’t need their services any more. And don’t worry, I was able to make sure they had opportunities after I let them go – I actually kept them for a few months extra just to make sure that happened. They were both awesome, and I got so much more done as a result of hiring them. Several months later, I started working with a U.S. based person on another project, and since then I have added a few more. Collectively, this is what I now call my team. My U.S. based team is much more expensive to work with. The team works far less hours (they don’t work 8 hours a day and the hours range depending on upcoming projects and timing), but the kind of work that’s being done is generally much more high-level. The most interesting difference to me, however, is the overall sense of TEAM and forward-thinking-ness I get from my U.S. based crew. My Filipino VAs were amazing, please don’t get me wrong, but they only did what I asked them to do and nothing more. It was my job to come up with the ideas and give direction, and it was theirs to get their assignments and do them well. The cool thing is that their tasks were usually done by the time I woke up in the morning due to the time zone differences. They made a big difference in my overall output. Not once, however, did either of them make suggestions for improvement of the brand or business in whole. Even within their specific tasks, they hardly ever commented on whether something could have been done differently or better. They just did what they were asked to do very well. It’s not in their culture to give suggestions back to those who are giving the orders, especially when the ones giving the orders are the ones who pay their salary. With my current team, new suggestions and improvements are talked about daily. They often make improvements on their own and make things better without me having to ask, and I love that. They each feel like they have a part in the brand and can have an effect on the future of the business, and that to me is something worth paying for if you have the resources to invest in that. I realize that not everyone can afford a team like that, especially when they are just starting out (it took me 3 years just to get comfortable with hiring a VA, let alone a team like this! ), but like I mentioned earlier the brand is growing so much, that I need to be smart about the work I do and those who will help me keep up with the growth, and help take it to the next level. A lot of what you’ve recently seen here on SPI is a result of more than just me – the iOS application, the new design of SPI, The Smart Podcast Player, and there are a lot of things that are coming to you later this year too. I can’t wait to reveal everything to you, but I can say that the entire team is excited, and I hope you are too! Thanks again for all of your support, and I hope you enjoyed this month’s report! Cheers!